See fabulous landscapes and wildlife on a malaria-free safari in the Great Karoo, at this Eastern Cape game reserve in South Africa. In the Sneeuberg Valley, Mount Camdeboo is located near Graaff-Reinet and within a 3 hour drive of Port Elizabeth, which is easily accessed by air from other major centres. 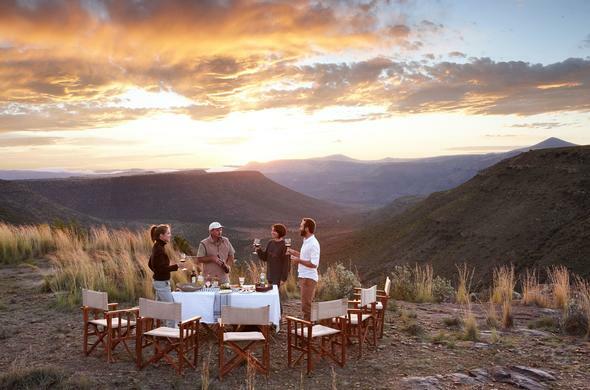 This Eastern Cape game reserve in Great Karoo offers a personalised wildlife experience in contrasting landscapes. The gracious homestead accommodation of this Eastern Cape game reserve in South Africa is in stark contrast to the arid plains, rugged mountains and crevices of the Karoo. Guests enjoy a warm welcome and relaxed elegance alongside the seasonal Melkbos River. Mount Camdeboo Private Game Reserve is 280km or about 3 hours by car from Port Elizabeth. Guests can also enquire about pre-arranged Helicopter Charters to the reserve. From Port Elizabeth, take the N2 to Cape Town, turn right onto the R75 and then right onto the R63. Continue for 5km and then turn left onto the Petersburg dirt road. Pass through 4 security gates, the 4th is the entrance to the reserve. Continue for a further 2.5km. Graaff-Reinet offers history and architecture - nearby find pre-dinosaur fossils, the quirky Owl House in Nieu Bethesda, fabulous cacti and the incredible Valley of Desolation.